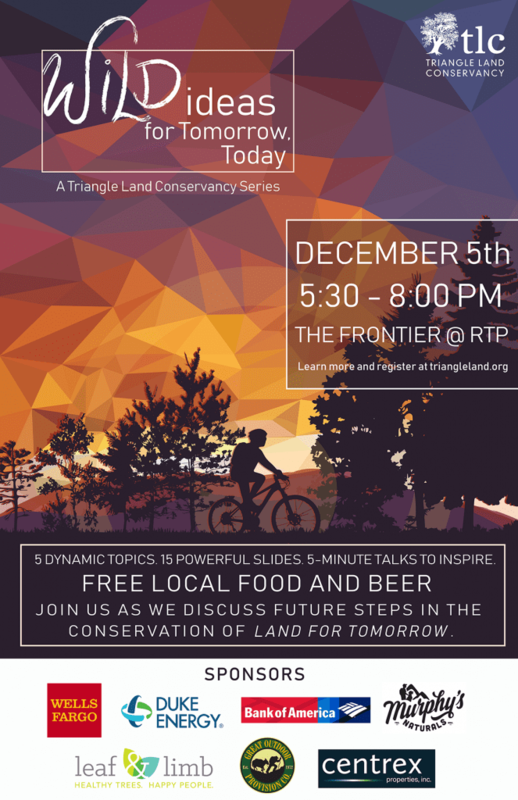 Triangle Land Conservancy will host Wild Ideas for Tomorrow, Today on December 5, 2018 at the Frontier at RTP starting at 5:30pm. Community members are invited to join us as we step into the future of Triangle population growth trends, discuss our changing climate in the Piedmont, consider who will carry the legacy of the land, and share what Triangle Land Conservancy envisions as we continue to conserve land for tomorrow. Register here. Triangle Land Conservancy’s Wild Ideas series provides a unique venue for experts and the community to share their innovative ideas to improve lives through conservation by safeguarding clean water, protecting wildlife habitat, supporting local farms and food, and connecting people to nature. At Wild Ideas for Tomorrow, Today you’ll hear from 4 speakers and see one short film about where our region is heading in future and how we can take steps today to conserve land for tomorrow. Talk one-on-one with the people making it happen during the Wild Ideas Expo that will follow the presentations. Local beer will be provided by Crank Arm Brewing and food by Vimala’s Curryblossom Café. The featured speakers for Wild Ideas for Tomorrow, Today are Dr. Anita Brown-Graham (Professor of Public Law and Government, UNC School of Government), Jen Schmitz (Principal Water Resources Planner, Triangle J Council of Governments), Kevin Hicks (Executive Director, Triangle Bikeworks), Sandy Sweitzer (Executive Director, Triangle Land Conservancy). The short film Bikes, Water & Soul will be screened that traces the 700+ mile journey that Triangle Bikeworks put together through its Spoke ‘n Revolutions program that took eleven young people by bicycle to discover the Neuse River Watershed from Chapel Hill all the way to the Atlantic Ocean and back. The emcee for the event is Toni Wyche Jones, (TLC Board Member and Environmental Engineer with the US Environmental Protection Agency). After the presentations, there will be an expo that features local organizations that help protect our local watershed, including Triangle Bikeworks, Mountains-to-Sea Trail, City of Oaks Foundation, Leaf and Limb, Schoolhouse of Wonder, Triangle J Council of Governments, Great Outdoor Provision Co., and more! TLC extends special appreciation to our program sponsors Bank of America, Duke Energy Foundation, Wells Fargo, Murphy’s Naturals, Great Outdoor Provision Co., Leaf & Limb, and Centrex Properties Inc., for their support of this free event.